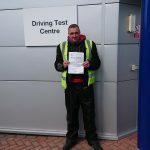 An excellent result for Dan Ames of Dorking for passing his DAS first time both mod1 & mod2, and here’s a few words from Dan himself: Did my DAS with MTS, Great people to learn from, who are patient and very helpful from beginning to end. Got me the pass for which I’m grateful for. Highly recommended. Thanks Dan, see you around for a cuppa some time!